This trap puts the "point" in poinsettia. A beautiful holiday plant turned into a powerful ice throwing ballista. The best way to send "Seasons Greetings!" to all those dragons in the sky. The Point-settia Ballista Trap Skin can be used on the Chrome Storm Wrought Ballista Trap. The trap's stats (power, power bonus, attraction bonus, etc.) are not changed. The Point-settia Ballista Trap Skin may be made available during the annual Great Winter Hunt event and can be traded on the Marketplace or through Give To Friends. 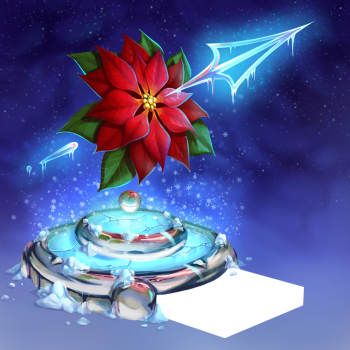 11 December 2018: The Point-settia Ballista Trap Skin was released as part of the Great Winter Hunt 2018. This page was last edited on 6 February 2019, at 14:58.